At Wink Bingo you’re always spoilt for choice. You can purchase between one and ninety-six 75 Ball tickets per game. A 75 Ball Bingo ticket is easy to spot. It has 25 randomly numbered squares made up of 5 rows and 5 columns. As with most bingo games, you simply need to fill in the squares when your numbers are called out. The amazing thing is that if you don’t fancy the numbers on a ticket you’ve just purchased, you can hit the ‘Get New Cards’ button and replace the current selection. You also have the option to manually choose one ticket at a time, or get the program to automatically purchase any given number of tickets in bulk (up to 96 per game). Purchasing tickets is easy. Once you’ve topped up your account, you can buy tickets from inside your favourite 75 Ball Bingo room, or you can purchase in advance. Check out our ‘Options’ button which enables you to customize your 75 Ball game to your heart’s content! There are 6 handy tabs in which you can adjust the sound, chat, game and general settings, daubing configuration, as well as a handy timer setting to remind you when your favourite games begin. There’s another cool feature that highlights your cards when there are 3 squares ‘to go’ until a win. This option is called 3TG (as in ‘3 to go’). The squares will also light up when you have 2TG and 1TG. In addition, ‘Best Card First’ lets you know which card is closest to winning. You can also use the Price Alert feature to indicate the prices of each card in your bingo room. This helps you keep track of your spending. 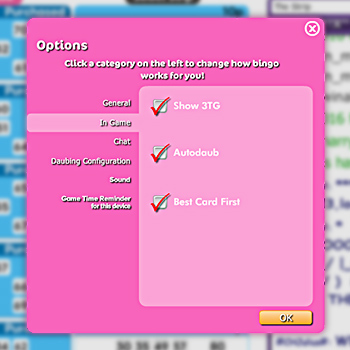 Speaking of bingo rooms, you’ll also discover a robust bingo chatroom panel, where you can enjoy fun group chats and private chats with fellow players. ​What Does It Take to be 75 Ball Bingo Winner? It’s all in the pattern! In 90 Ball Bingo, you must fill up your whole ticket in order to get a BINGO win. In 75 Ball Bingo, things get even more interesting. Instead of filling in the whole card, you need to complete a pattern that is determined before the game begins. The bingo caller will call out numbers between 1-75, and you need to mark them off on your /ticket. The process of marking your numbers is also referred to as daubing. Most online bingo games have an auto-daub feature whereby you can set the game to mark your winning numbers automatically. look like a plane if the prize is a holiday. Or maybe it’ll look like a Christmas tree during a Christmas Bingo game! . If more than one players wins, the prize is split equally between the winners. For the most part, 75 Ball Bingo prizes are determined by the number of players taking part OR by the cost of your ticket. More expensive tickets usually yield more valuable prizes. At Wink Bingo, you can also find fixed prize 75 Ball games where there’s a fixed ‘minimum reward’, no matter how many players partake or how much the tickets cost. So even if there’s only one other player in your game, you would still win that ‘set’ minimum amount. It’s always best to keep an eye on the game schedules to see what prizes are on offer. If you like to be kept on your toes, then you’ll LOVE 75 Ball Bingo. The fun coverall patterns mean that no two games are the same. Each game is fantastic and fast, with decent wins for added excitement. On top of that, you get to socialize in the bingo chatrooms, where fun is guaranteed. All this is available on mobile, desktop and other handy devices. What more could you want!